All purchases of office furniture over $1,000 may be leased from e3 Office Furniture & Interiors. Other costs, such as space planning, interior design and moving charges can be included in the lease as long as they do not exceed 20% of the total value of the purchase. Please see the below sections to learn of the many advantages that leasing provides. For the same amount of money you spend replacing worn out and inadequate furniture, you could provide all employees with new furniture at the same time with the same annual budget. In addition, you will reduce your workload by taking care of all requirements at the same time rather than being continually required to procure new furnishings. You can lease your furniture, equipment and movable architectural walls from e3 Office Furniture & Interiors for up to 60 months. Many companies lease their office furniture and equipment, but now you can also lease the full height walls that divide your office space. Instead of building fixed walls, you can lease movable architectural walls. 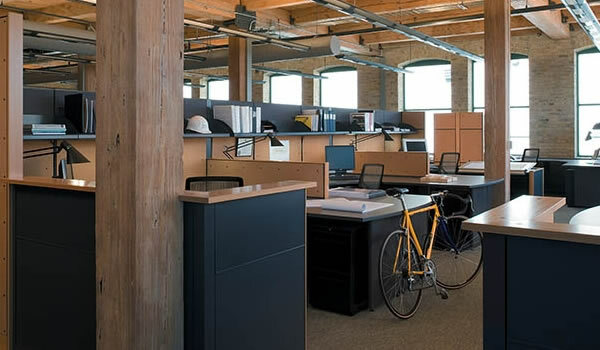 Unlike fixed walls that belong to your landlord once constructed, you can take your leased architectural walls with you to your new office space. This gives you more bargaining power with your current landlord when your space lease comes up for renewal. Don’t get tied to a space and don’t spend your hard earned cash on walls for your landlord. You work too hard for your money to give it away. Whether you need your cash to pay operating expenses or to invest in new software, leasing enables you to invest in assets that make you more efficient and competitive. The acquisition of assets via leasing conserves cash that can be used for raw materials, work in progress, inventory and advertising, as well as other revenue-producing activities. Leasing provides 100% financing and avoids the necessity of pledging existing assets such as inventory or receivables for security. A fixed-term lease removes the fear of cancellation or recall of bank borrowings. Once a transaction is finalized, the cost and monthly cash requirements are fixed and unaffected by changing general interest rates. This is especially meaningful during periods of fluctuating rates and potential instability. A lease payment is fully deductible as a business expense, and often provides a faster write off than capital cost allowance via ownership. This generally improves your cash flow and results in leasing being less expensive than ownership. Annual budgets can easily be determined when equipment and operating costs are fixed. It is also much easier to get the approval of a small monthly payment than a large capital expenditure. Through leasing, you can have vital equipment immediately without waiting for budgeting delays or head office approvals.